Friday, April 20th marks the 2nd anniversary of the BP Gulf Oil Spill. For those of us who live, work and play on the Gulf of Mexico (GOM) coastline, it is not a happy day … at all! What has happened during the past 2 years which might give us hope that the US Federal Government or BP might be taking this unprecedented oil spill seriously? If we are to portray the true state of affairs of this worst oil spill in American history, it would look like this excellent report from the Gulf Rescue Alliance. As you can see from this report, as well as from all the anecdotal evidence gathered to date, we have every reason to believe that the Macondo Prospect well in the GOM is still leaking. A substantial amount of mostly circumstantial evidence has been consistently provided which indicates an oil well and surrounding area which has been irremediably compromised. Just what exactly does this mean? Because of the degree to which the sub-seafloor geological formations in the Macondo were undermined throughout the entire process of drilling, experiencing one or more massive explosions, followed by 87 straight days of gushing hydrocarbon effluent, the geological strata was forever altered. These critical geological transformations translated to significant changes in the topograghy of the seafloor around the previously gushing well. New cracks and crevices, fissures and faults, leaks and seeps, craters and clefts were created which allowed for the oil and gas emerging from deep at the source to find numerous conduits through all the way to the GOM seafloor. The far-reaching ramifications of this predicament are inestimable, because we don’t know two critical points of information: (i) How much pressure is the hydrocarbon effluent under both at the wellhead and at the source, at over 18,000 feet deep? (ii) What volume of hydrocarbon brew currently exists at the source? Regardless of the answers to these questions, two things remain apparent. (1) Given the very high pressure readings which were estimated during the flowing oil volcano of 2010 (and those taking upon capping the one well), it is certain that the hydrocarbon effluent will attempt to find every way possible through the fractured and unsettled geology and into the GOM. (2) Given the public record evidence of the amount of oil estimated in the immediate area of the Macondo Prospect, BP tapped a well which may never stop leaking in our collective lifetimes. Some experts, who operate outside the box of mainstream petroleum engineering and geology, have even stated that this predicament has been duplicated hundreds of times throughout the Gulf of Mexico. In other words, oil wells blow all the time, we just never hear about it. Not like the Deepwater Horizon, mind you, but they become problematic in different ways. Therefore, there exists an evolving situation on the GOM seafloor which would startle those who regularly swim and fish and boat there, especially anywhere near the Louisiana coastline. “The simplistic and geologically unrealistic aim of plugging a single tubular hole in a solid mass of rocks is as unreal and unstable as a “sand castle on the beach”. After months of spewing a corrosive mix of gas, oil and brine into the fragile faulted Gulf Salt-Geology, even the most optimistic geologists would come to the grim conclusion that the 18,300 ft well is no longer the only vertical conduit out of the reservoir. In all probability, a complex multi-pathway monster has developed in its place. As said many times before, there is simply no way to put the genie back into the bottle”. In the ‘wake’ of Katrina, most everyone knows that the city of New Orleans is surrounded by a vast system of berms and pumps in order to keep the city dry. In fact there are urban areas which currently exist under sea level, not too unlike parts of the Netherlands. The upshot of this progressively worsening predicament is that this major urban center continues to sink, as does much of the land around it. What is particularly curious about this report is that it neglects to discuss the connection between the stunning degree of subsidence and the inordinate amount of oil and gas drilling which has been performed around the same area since the early 1930s. Bear in mind that it has been proven many times that removing vast amount of hydrocarbons from the earth will always create ideal circumstances for the earth to resettle and re-conform itself around the voluminous displacements which inevitably occur with the extraction process. These begin as micro-displacements, which eventually aggregate into larger ones, that can ultimately effectuate macro-displacements such a earthquakes or other types of seismic activity. When these displacements occur near a fault line, they can trigger all manner of geological movements, from underwater landslides to shelf rearrangements. As we all know, the bigger the displacement, the greater the likelihood of a tsunami due to the resulting massive displacement of water. Wherever oil and gas drilling operations are conducted in the water bodies of the planet, subsidence is a known fact of life. 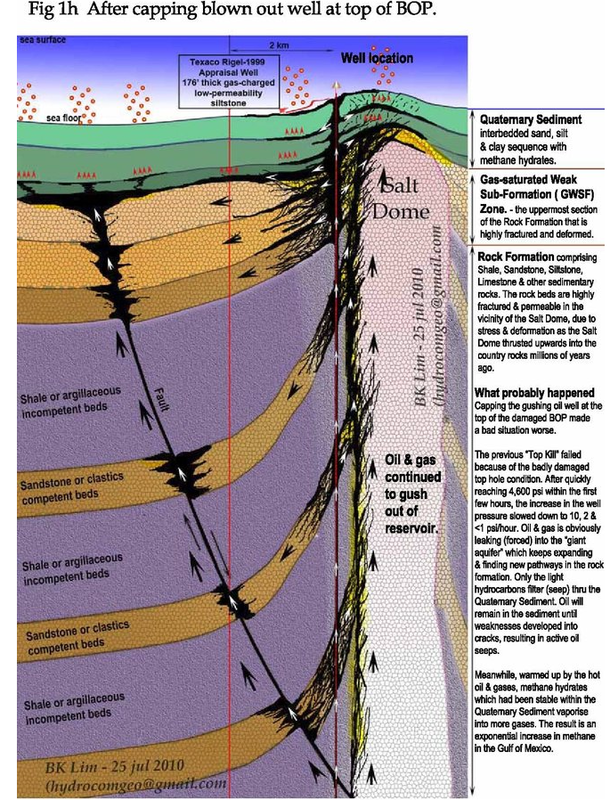 Given the enormous water pressures which exist at these deepwater drilling sites, it is quite easy to understand how new geological dynamics result from a surfeit of indiscriminate drilling. This is exactly what occurred in the Macondo Prospect in April of 2010 when BP, Halliburton, Transocean and Anadarko all participated in a highly ill-advised oil venture. The essay entitled The Gulf of Mexico is Dying – Part I clearly explains the highly risky circumstances under which BP chose to drill in this area. The report also goes on to delineate the awesome unintended consequences and collateral damage from this foolhardy enterprise. Foolhardy because the import of the previous “Subsidence Report” is well known to all the big oil companies, as it is to the appropriate federal departments and state agencies. 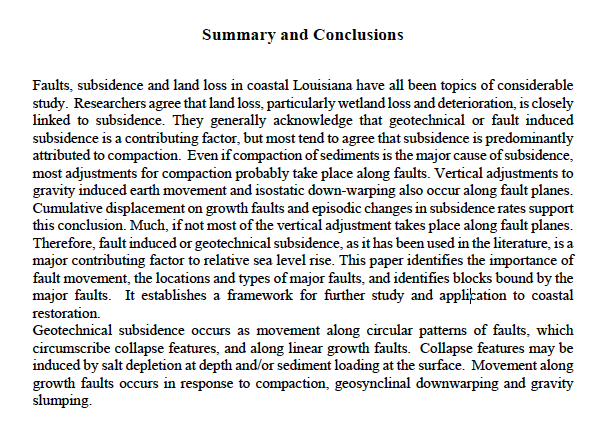 The confluence of circumstances which converge in the Mississippi River Basin and surrounding GOM region make this area particularly vulnerable to land loss, subsidence and other profound coastal dynamics. By continuing to drill in this GOM region, the many risk factors associated with future oil spills will only increase in number and intensify in severity. Here we have Louisiana land sinking at the rate of 25 square miles per day, and nobody’s talking about it?! Not the Departments of Interior or Energy, not the Coast Guard or NOAA, not even the EPA? Of course, there is absolutely no discussion around the correlation of decades of oil and gas drilling and the alarming rate of subsidence. Even various state governments and the hydrofracking industry have acknowledged the direct relationship between the increasing incidence of seismic activity and fracking operations recently conducted in several states. Hydrocarbon Effluent + Corexit = ? Does anyone really know what happens to a body of saltwater and all of it life forms when oil and dissolved methane gas are continually mixed with COREXIT in order to systematically disappear the surface oil slicks? The following picture we believe represents the obvious and most catastrophic effects on the animal life which has suffered greatly up to this very day. The real unknown in the petrochemical cesspool that has been created is how the Corexit will alter the chemical breakdown of the oil. But, more importantly, how will oil-eating bacteria relate to the new and foreign compounds created by the Corexit. Even more critical is how these new chemical combinations will bio-accumulate throughout the food chain as it wends it way onto the American meal table. There is no question that, as these toxic chemicals inexorably work their way up the food chain, higher toxic concentrations will show up in the tissues of those higher up in the chain. The seafood, therefore, coming from the GOM is not safe to eat. Why? Because sufficient toxicological studies have not yet been performed. All of the appropriate departments, including the CDC, EPA, NOAA and Dept. of Interior have shirked their responsibilities around this highly consequential matter. That’s because it is especially consequential for the entire GOM fishing industry. That represents a HUGE regional economy with lots of potential political and certain commercial repercussions. Should economic and political matters trump health and environmental?! Another very important point about the application of traditional toxicology research studies is that they typically look at chemicals in isolation. Interactions are rarely addressed in this field, nor are the inevitable synergistic effects which result from different chemical compounds like various polycyclic aromatic hydrocarbons that are associated with oil spills. This scientific deficit has created a critical void in our knowledge base, and therefore substantially limited our ability to respond appropriately to many toxic exposures. The 2nd Anniversary has produced a spate of revealing articles. There has been a flurry of great articles, press releases, videos and documentaries that deserve proper attention on this 2nd anniversary of the BP Gulf Oil Spill. We have provided the tiles and links below, not in any particular order or priority, so that the reader can become further enlightened in order to make informed decisions. 2 Years After the BP Oil Spill, Is the Gulf Ecosystem Collapsing? The best solution to this ever-evolving environmental and public health disaster is to stay informed. Seeking out the best sources of information, which resonate intuitively, is crucial in this war for people’s attention. There are many credible resources available on the internet, so pick and choose those which address the immediate concerns in your geographic area. The problems on Pensacola Beach will be different than those on Siesta Key, where red tide has been a serious problem for years, for example. In this regard, the GOSRC will endeavor to stay abreast of the most recent developments in the waters, on the beaches and with the seafood. Steven Pedigo has provided a voice of reason throughout the BP Gulf oil spill. “Corexit’s label clearly states it can cause kidney failure and death and the MSDS (Material Safety Data Sheet) specifically warns, “Do not contaminate surface water” with it. Additionally, toxicity testing in regards to marine species shows little tolerance by all forms of sea life; thus, applying it on spills as a preferred response method increases the toxicity of the spilled oil on which it is used,” Steven Pedigo emphasized. “The toxic dispersants add absolutely nothing to EFFECTIVE RESPONSE. There is no scientific basis for it, and their use violates The Clean Water Act, EPA’s charter and common sense. All stakeholders continue doing the same thing over and over again, with the exact same negative outcome—although the EPA calls the toxins in dispersants’ reasonable tradeoffs’, Corexit and dispersants like it, have a horrible track record”, said Steven Pedigo, CEO OSEI. “Since the EPA did not seem interested in finding an alternative for toxic dispersants, we decided to seek pre-approval through the DOI since they themselves preformed the testing showing dispersants to be questionable in truly remediating a spill”, commented Pedigo. There has been a tremendous amount of discussion for the past two years about what has really gone on here in the Gulf. Here’s the scoop! The official response to the BP Gulf Oil Spill has been controlled like no other response in American history. The US Government, to include the EPA, NOAA, Energy, Interior, the White House, has colluded with BP et al. to keep the lid on what has really been taking place in our waters, on our beaches and with our seafood. (1) First the government exerted its total control over all the concerned agencies and departments responsible for any aspect of the oil spill. Therefore, all of the previously mentioned agencies were immediately co-opted to execute a political agenda in which economics and politics always trumped health and environment. (2) Next the government, in collaboration with BP, sought to control all other public institutions like the OSATF (Oil Spill Academic Task Force in Florida). There are true advocates working in academic bodies like the OSATF; however, once they were included under the BIG UMBRELLA, everyone was expected to fall in line. Almost everyone did, with a few notable and courageous exceptions. How it works is that if a geology professor were to break ranks, his department chairman might be contacted about a large pending government grant which ‘might’ be put into jeopardy. The ways of controlling those who are expert in the relevant academic disciplines are endless, and unfortunately have profoundly compromised the entire information gathering-process. (3) Funding, as you just read, is the oil of all academic and scientific research. Without it, nothing gets done. Therefore, whoever controls the funding process and grant approval controls the message. From speaking with many, especially those who function within the relevant institutions, no one has ever seen such a clampdown. It appears that the US Gov’t/BP Juggernaut has just about ensured that unless one plays by their rules, no funding will be forthcoming. “YES!”, it is that controlled and oppressive. While this ongoing, multi-institutional dynamic has been operative for many decades, it has now entered a new realm of self-enforcement —> “Their way or the highway!” This has simply forced many truth-speakers to take to the information highway … with a vengeance. Here’s an example of how BP had allocated the first installment of a $500 million dollar grant program to Florida universities in the amount of $25 million. How much control do you think $500 MIL can purchase?! (4) Of course, the absolute control of the mainstream media has been the cornerstone of their strategy to control all information that flows into the public domain. Whereas the media seemed to be on top of the real story in the very beginning, it now seems that occurred for dramatic effect. As soon as the Macondo well was ‘capped’, virtually everyone went back to sleep, particularly the mainstream media. Only Huffington, whom we consider to be hybrid media in spite of their HUGE Alexa rank, had done a pretty good job with some BP oil spill angles. Here’s an MSM piece out today that sends more mixed messages than a …. (5) As for the alternative and fringe media, there have been major battles going on from day one. See how BP has saturated the ad space of each and every website and blog with their BP ads claiming they have fixed the GOM, are fixing the GOM, will fix the GOM. What must be pointed out is the vast amount of financial allocation necessary to run all these ads 24/7 for two (2) years. Couldn’t that money have been much better spent on really fixing the problems instead of paying lip service? The extraordinary efforts by BP to coverup the ongoing BP oil spill challenges is now legend; their numerous and fierce initiatives to airbrush anything having to do with the cosmetic aspects of this oil spill are likewise unparalleled in modern industrial disaster history. The counties were then subordinated to BP and could forcefully be compelled to control fact-finding citizens and truth-seeking professionals, which they did. One need not look any further than the citizens tensions between Florida and Louisiana to begin to understand how they can control the information flow. Louisiana is a drill state and has been all about oil for since the 1930s; Florida couldn’t be further from that position given the predominance of its tourism, agriculture, boating and fishing. When two states are operating at cross purposes in regard to such a formidable undertaking as remediating the biggest oil spill in us history, one can appreciate the many hapless implications of such an unworkable relationship. Bear in mind that Louisiana politics has been oiled by petrodollars for decades. Almost everyone is connected to the Oil & Gas Industry in some way, shape or form. One almost has to leave the state to get away from the slick and sleazy influence that goes with this territory. Therefore, much of the official info and data is often tilted and distorted, polished and airbrushed to meet the demands of the ‘hidden’ agenda of the Oil & Gas Industry. There are many effective citizen advocates in NOLA area who have broken out of this box. Since they are so close to ground zero, they have provided much valuable information and proven to be indispensable info/data resources. This one is a real challenge because of how many are unwittingly controlled, and don’t have a clue. Many who fall into that category have been used as instruments to undermine the true citizen advocates among us. The degree to which divide and conquer has been utilized with great effect through controlled opposition strategy is quite extraordinary. Until you have been a victim of such tactics, as the GOSRC has, you really can’t imagine the extent to which your environmental or health advocacy can be paralyzed. As for the Controlled Opposition which may be executed through a formal COINTELPRO Op, an environmental advocacy organization would have to be set up like a CIA special task force where each member executes on a strictly need-to-know-basis and the entire operation is strictly compartmentalized, in addition to being completely firewalled where it concerns internet services, both software and hardware. What environmental organization in the world can ever practically function under such conditions in order to protect itself and effectively stave off attacks from any direction, at any time?! Very nice work as I read Part 1 – “The GOM is Dying”. I had the Hopi prophecy in mind and of course in true form you drop it like a closing crescendo to a master tragic play. My brother is rich from the oil pumping game. I can tell you for a fact every bit of hydrocarbon on this planet is abiotic it is only when it gets close to the surface that bacteria starts to feed on it breaking it down into tars and gases and fixing sulfur. At times in the planets history these pockets of high pressure hydrocarbons find their way to the surface and erupt in massive flows of billions of gallons. This is how we get things like coal, as the massive flows cover low lying areas such as swamps; and the flora and fauna are entombed as the flows slowly evaporate and harden in the open air. Over time these flows are covered with sediment layers and become the high sulfur coal we all love and cherish. Yes, Tom, all hydrocarbons are radioactive to varying degrees depending on how old it is, the fresh stuff can be very hot. I have known of the huge deposit of methane in the GOM since the 80’s as a friend of mine was a retired high level engineer at SoCalGas. He said when they first found it they thought they had made some huge mistake in the calculations and eventually had to fake the results as the news would have made NGas almost worthless. Even I was shocked at the number of wells – looks like a perfect setup for major disaster. So if we have a major quake along one of the many faults we could produce a hydrocarbon volcano with a mile wide caldera dumping millions of gallons a second. As this mass rises, as it is lighter than water, eventually sea water will fill the void assuring the complete emptying of the reservoir. The great part is the loonies were thinking about using a small tactical nuke to seal up the deep water horizon mess. Gee, what are the chances they get it wrong creating the very volcano we are talking about. If this does happen then I will have no doubt of the truth of the Hopi, not that I doubt them much anyway, but the potential is obviously there for this formation to cover the worlds oceans in black death. Happy, happy, joy, joy have a tuna sandwich its chocked full of what your body needs heavy metals, hydrocarbon toxins and yummy potpouri of radio isotopes, don’t forget the wonder bread and canola, soy mayo with extra added BHT to keep it fresh and tasty. Oh, I almost forgot the GMO tomato and the cloned hydroponic lettuce grown with the purest petrochemical waste products also known as “Miracle Grow” under artificial lighting powered by, you guessed it, hydrocarbons. Dude, what is that black gooey stuff dripping from your lunch box? At least we can stand with our heads high knowing we would stop this if we could knowing and saying just how wrong it is!!!!!!!!! Some folks have the strangest Karma and ways of working things out in this cosmic play so who knows how it will end up. Our last stop of the day is atop the Wilmington Oil Field, the Southland’s largest field in area and output. It is fifteen miles long and five miles wide, extending from Torrance to off Seal Beach, underlying most of the port of LA and Long Beach. The field has produced close to 3 billion barrels of oil since its discovery in 1932. In 1964 it became the first oil field in California to produce a billion barrels, the second one in the nation to have done so at that time. The field, discovered after most of the LA basin’s fields, was attacked with vigor. Within just a few years the land above the field was noticeably sinking. By the 1940s, after only a decade of oil production, the land level was dropping to such an extent that buildings and roads cracked, oil well casings and pipelines sheared, and portions of the port flooded. Subsidence reached its peak, or pit, in the early 1950s, when the ground dropped by four feet in just two years. The lowest point of the subsidence bowl was directly above the middle of the oil field, at the northern end of Terminal Island. Here the land was 29 feet lower than it had been before oil production began. The nearby Naval Ship Yard had suffered damage and flooding and the entire port itself was in danger. Drilling for oil was banned in Long Beach. A program to inject water into the wells commenced, and soon the land stabilized and eventually began rising, as if inflated by air. The drilling ban was lifted in the early 1960s (though it remains in place to this day in the residential parts of town). Today an extensive network of water injection wells operates continuously, returning 105% of the volume of oil and water extracted from the field, in order to maintain equilibrium. Water injection will have to continue long after the oil is gone. This helps to give some factual insight as to how much land subsides per unit of oil removed. Also, most oil wells have formation water associated with the oil so that comes out to and is not counted. So, now we have the GOM with the same fractured geology as CA, not to mention billions of tons of water sitting on top of that broken terrain. How very sad it all is. Pingback: EPA Grossly Misrepresents The Toxicity Of Corexit Used In Gulf Of Mexico | Oil Spill Solutions Now! Time to speak up TOGETHER! WORLD CITIZENS PETITION OBAMA: SOLVE FUKUSHIMA – PLEASE SIGN – GO VIRAL!